The best part about being a pirate is answering to no man/woman, but yourself. 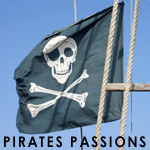 A pirates life is a truely free life. "Take what you can, give nothing back"
` ARR, this place be nearly dead.